1. New York Income tax is still too high – I realize it is somewhat psychological, but when state taxes start creeping up to almost as much as your Federal income tax, it just feels like it is too much. This year wasn't as bad as past years, but it remains close enough to the Federal level to make me feel like it is too much for what I’m getting. 2. 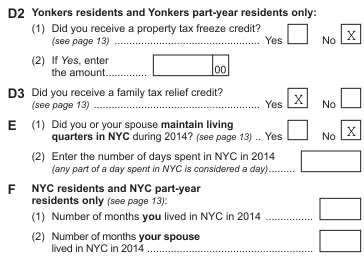 If the 1040 can be done in 2 pages, why does New York’s equivalent, the IT-201 need to be 4 pages? Well, I guess because its New York. Maybe instead of baffling normal citizens with tax tweaks, why not streamline the system and just have everyone pay a percentage of their Federal tax (or permit this option as simplified filing... so that you can choose going out of your mind trying to figure out New York nuances or you can give up and just calculate your tax based on a percentage of the Federal tax owed). 3. Isn't there a better way to handle local income tax? Thankfully, I don't live in Yonkers or New York City and many others in New York don't live in these areas either, so why do we all need to suffer with a convoluted and confusing form? For example, in the picture below from form IT-201, why is there a “D2” for Yonkers, then a “D3” presumably for everyone and then an “E” for New York City and then an “F” for more New York City? “D2” would seem to have a relationship to “D3” as they're both “D’s” but yet they seem to apply to 2 different groups. In contrast “E” and “F” are both about New York City so it would seem to me that it would make more sense that they be marked the same letter with a number. 4. Buying votes the New York way... D2 and D3 above reflect credits whereby out of the goodness of their hearts our political leaders granted these "credits" and sent out checks (a separate check for each credit) which coincidentally seemed to arrive during campaign season. While I appreciate money back (thank you), I question whether this is truly in the best interest of tax payers. There had to be an enormous cost to computing who gets each credit, printing paper checks for all these people and mailing them all out. And for all you New Yorkers who itemized on your Federal return last year, don't forget to include these in your income... (as though it isn't hard enough to keep track of as it is)... if you're relying on using the same tax software as last year, be aware that it probably won't pick up these tax refunds. 5. Line 59 Sales or use tax – remember that Hawaiian shirt that you bought on vacation in a state that doesn't have sales tax on clothing? Well, guess what? New York State wants you to pay them the tax that you would have paid if you bought it in your local area. Ok, I get it that if someone hauls back a house full of tax free furniture or routinely makes all purchases tax free over the Internet, but it seems like there should be a threshold here or some sort of common sense for normal travel and light commerce. 6. Voluntary Contributions… Really, New York? Do we not get hit up enough so that we need to use our tax form to solicit contributions to charitable organizations? While I don't dispute the merits of the listed organizations, there are many others that aren't listed that merit support as well. So why do some get state sponsored and others not? ... can you list me on line 60k next year? I could use someone else's voluntary contribution!